In-water displays have increased by about 40 percent from last year. 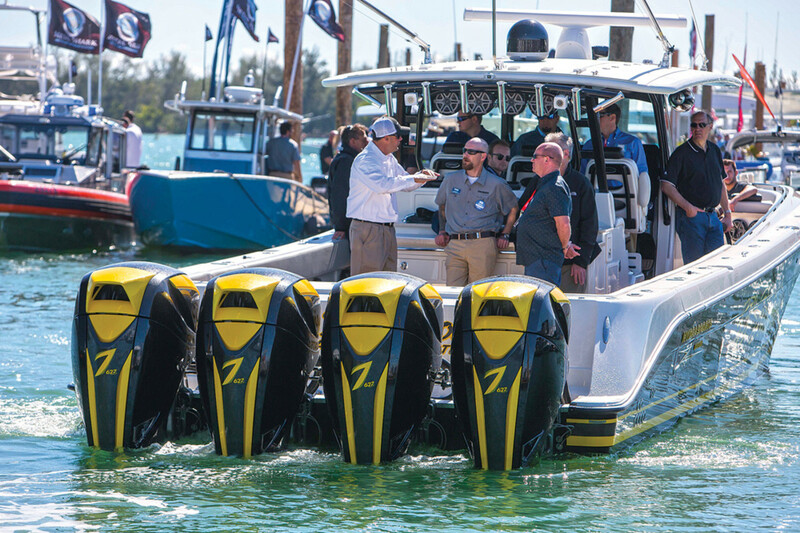 The National Marine Manufacturers Association pulled off a major endeavor when it moved the Miami International Boat Show from the Miami Beach Convention Center to Virginia Key in 2016, albeit with some growing pains. After working all year to alleviate clogs getting in and out of the venue — addressing transportation, parking, pickup and drop-off stations, adding water-taxi capacity and making other improvements, organizers say they’re ready for the 2017 show at the Miami Marine Stadium Park and Basin Feb. 16-20. The ability to offer sea trials was “a huge hit” at the 2016 show, and in-water displays have increased 40 percent, Dammrich says, growing from 409 to 565 boats in the water. An additional 100 yachts as large as 105 feet will be in the basin this year — with the face dock 60 feet shy of a third of a mile long. “This is the largest temporary marina ever built in the world,” Dammrich says. There will be 1,300 boats on display, plus huge tents filled with accessories, all at an estimated worth of $3 billion. There will be more than a million square feet of display space. 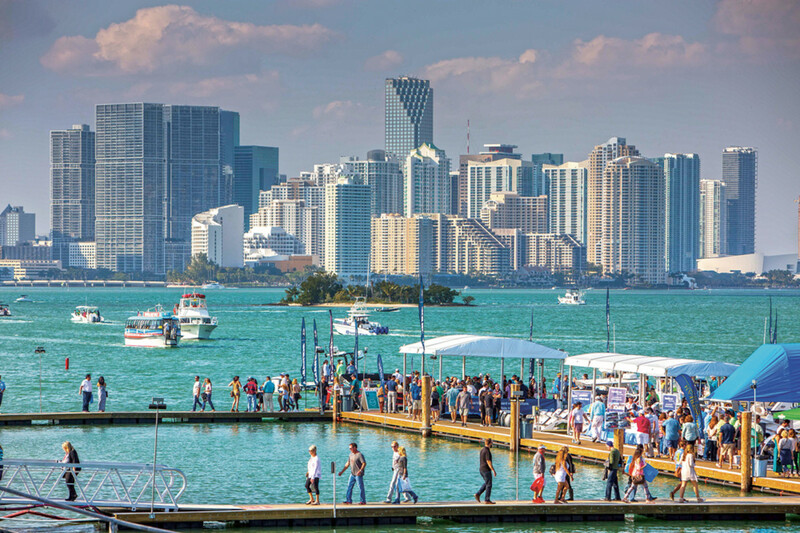 In addition, Strictly Sail Miami, which takes place at Miamarina at Bayside, will feature 130 sailboats. Outboard center consoles will fill the docks, with boat and engine makers eager to show their product in action. In 2016, organizers had planned to transfer 25,000 people via water taxi, but wound up carrying almost 53,000 each way, leading to long lines and frustration. In 2017, 47 percent more water taxis will allow 125,000 to be transported one way — about a 150 percent increase. The routes have been streamlined from seven to four, so pickup and drop-off will be more frequent. There will be 25 large vessels, compared with 17 water taxis last year, with capacity for 50 to 350 people — larger than most vessels last year. A taxi and Uber drop-off and pickup area should help alleviate some of the tangles getting into and out of the show at opening and close. That should also help allay a concern for exhibitors who traveled from the Miami International Boat Show to Yachts Miami Beach, the separately owned and operated show that takes place concurrently along Collins Avenue and at the Island Gardens Deep Harbour superyacht marina on Watson Island. Many exhibitors had booths or clients in both locations and had to move between the two. The NMMA and Yachts Miami Beach organizers are sharing the expense of 12 buses running between the two shows for far more frequent service, but Cashman says that even though MarineMax has 16 displays between the two shows, he will be committing to a full day at one or the other without shuffling between. The shuttle bus system at the NMMA show is being managed by Hello Florida this year, which the NMMA says is a company with tighter management. The buses will drop people into a newly paved area in front of the show. A sidewalk running the full length of the swale between Whiskey Joe’s and the show entrance is designed to make navigating the show easier and more comfortable. Parking also will be enhanced with VIP space at the Miami Seaquarium, where handicapped parking also will be offered. Organizers say there will be better signage so people have an easier time getting where they need to go, and there will be more plentiful and convenient parking in general. Boat show organizers say a series of improvements will go into effect at this year’s show. The NMMA hired Great Performances, the firm that managed the Miami International Tennis Tournament, to manage food services. The show will have six major food service locations throughout the show, offering higher-quality and more competitively priced food options. The NMMA has added restroom facilities and will mark them with big balloons above so they’re easily located. They’ll be scattered throughout the show, but there will be a big block in the center court area next to the Miami Marine Stadium so they can easily be located. All 1,004 tent lights have been replaced with LEDs that have 35 percent more lumens. That change was made after exhibitors complained about last year’s lighting. “I am very excited about the show and expect that [it] will be the best one in its 76-year history,” says Regulator Marine president Joan Maxwell. “With great new food venues, better water-taxi and bus schedules, plus, of course, the ability to see and water-test boats, customers will find one day at the Miami Marine Stadium may not be enough to enjoy all that the 2017 show has to offer. Coincidentally, Republican members of Congress will be meeting on the weekend of the show at Key Biscayne, “so we will be hosting a number of Republican members of Congress at the show,” Dammrich says. For the first time, the NMMA secured a music license with the American Society of Composers, Authors and Publishers to allow exhibitors to play music in their booths at a reasonable volume. 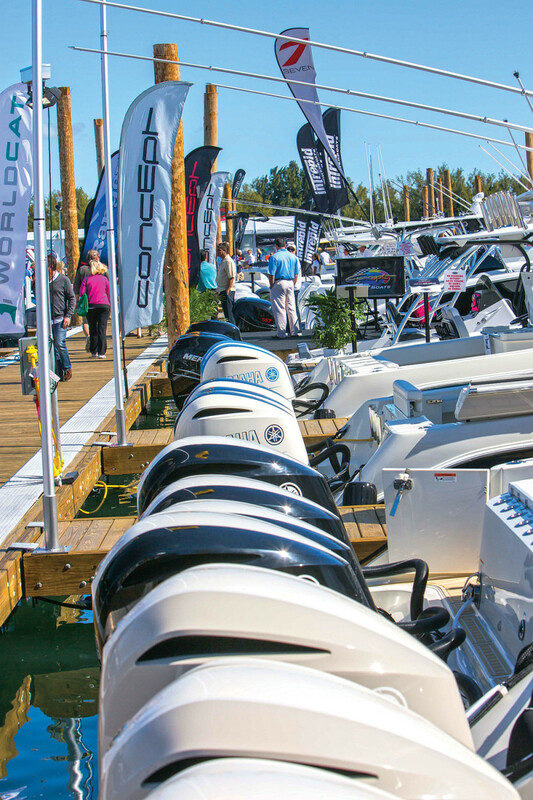 “To be successful, we need to provide an experience for the attendee, creating an atmosphere that entices them and gets them excited about boating,” says show director Ben Wold. The NMMA says its staff will monitor all music and has the authority to adjust the volume, as necessary. Organizers also rebranded the All-Industry Breakfast to the Innovation Breakfast, a hat tip to the Innovation Awards announced at the breakfast. Traditionally held on the opening day of the Miami show, the event will move to the show’s second day — Friday, Feb. 17 — and relocate to the show’s new Center Courtyard area at Miami Marine Stadium. Sea trials and demos are top selling points for the show. The 111-foot Biscayne Lady will be adjacent to the large-yacht section of the show as part of a VIP experience, offering air-conditioned lounges, upscale dining lounges and concierge services. On-water, hands-on training capacity is doubling this year; last year, 400 people took advantage of the classes, and this year 800 will be able to take classes. Many manufacturers are increasing their in-water displays, although others, such as Regulator, have always preferred to keep all of their boats in the water. Boston Whaler will bring all of the 31 models in its lineup. “We have a nice setup indoors and a really nice setup outdoors, and they’re adjacent to each other,” says Vaughn. Most of the boats 28 feet and above will be outside, as will three smaller models that will be used for demonstrations. Sea Ray will vastly enhance its on-water experience for customers, the company says. ”There is just something different about stepping aboard a new vessel on the water. We wanted to provide more of that experience this year,” says Brad Anderson, Sea Ray sport boat and sport cruiser president and general manager. Sea Ray will bring eight boats to display on land and will have 16 in the water. “The count is consistent with last year; however, this year the majority of our boats will be in the water at Virginia Key, and we are adding two sport yachts to that location,” Ward says — a 40-footer and a 46-footer. Sea Ray will unveil the SLX 400, building on the success of the SLX 350, the SLX-W 230 — a wake boat marking the entry into a new segment for the company that officially debuted in Atlanta — and a new Sundancer, though details were being kept under wraps leading up to the show, Ward says. Boston Whaler is also staying mum about its new product introduction, but Vaughn promises that the debut will be exciting. The Lagoon Seventy 7 — a 77.5-foot, fiberglass sailing flagship catamaran — will make its world debut at Strictly Sail Miami at Miamarina at Bayside. Scout Boats, one of many brands MarineMax represents, will bring a new 38-footer, according to Cashman. Additionally, “They’re going to pre-debut a very exciting project,” he says. Scout will introduce the concept of a 50-foot center console, the builder’s largest-ever model. To date, the largest is a 42-footer, “which has been sold out since it came into existence” at the 2015 Miami show, Cashman says. Having the accessories and boats on land grouped so close to those on the water makes for a festive venue and a great place for accessories manufacturers to showcase what they have to offer, says Eric Breitmayer, president and CEO of New Bedford, Mass.-based Imtra, a manufacturer of marine accessories and a distributor of select accessories. Imtra will debut several products, including Colorlight’s CLite2 LED searchlight — which is up for an Innovation Award. The unit on display will feature an integrated FLIR IR camera so visitors can watch people move through the tent on screen, Breitmayer says. Imtra also will bring a new line for the company called Zipwake. That company’s Dynamic Trim Control System is a standalone system that optimizes the performance and ride comfort of planing and semi-planing boats. Imtra also will debut its new Offshore and Pitmaster range of high-output LED utility and deck lights. It’s also a venue in which electronics manufacturers make their product debuts, says Louis Chemi, COO at Navico Americas. “We’re very excited. As far as Navico is concerned, our major new product launches in Miami. As far as the public is concerned, they get to see major releases in all three brands — Simrad, Lowrance and B&G,” Chemi says. For electronics manufacturers, it’s the last major consumer show before the big selling season — “really the last chance to throw something out there in the eyes of the consumer before the buying season,” Chemi says. Though Navico does not sell direct — only through dealers or directly to boatbuilders — it gives boaters a chance to see what’s new and talk directly to the factory about the products. Last year, Navico had its booth out on the docks, which Chemi calls “a fantastic improvement.” That allowed the company to use transducers, fishfinders and cameras so consumers could see the fish swimming beneath the docks on big screens. Last year FLIR and Raymarine took media representatives on a cruise, giving them a chance to use and experience the newest equipment. This year the event will be on land, but it is always a venue in which the company unveils new products. Humminbird by Johnson Outdoors, Garmin and Furuno also make product introductions at the venue.